You don't need to be limited by a standard-sized USB cable. 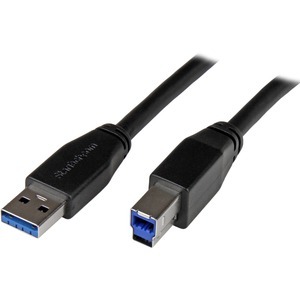 This active USB 3.1 Gen 1 (5 Gbps) cable, better known as a USB 3.0 cable, lets you position your USB Type-B peripherals where you need them, up to 10 meters away from your computer. Now, you can locate USB devices such as portable hard drives and external video capture devices to make better use of your workspace. This 10-meter (30-foot) cable has a built-in equalizing chip that delivers a reliable connection, with no signal loss, beyond the 3-meter limit of standard USB 3.0 cables . The USB3SAB10M is backed by StarTech.com's 2-year warranty for guaranteed reliability.